Believe it or not, the comic book industry in Australia isn’t as small as you’d think. In fact, it is actually quite large thanks to domestic publishers like Gestalt Comics. While American-based publishers like “Marvel” and “DC” produce some incredible comic book series’, it’s always nice to get in touch with something a little more…local, and there is no better place than Gestalt for tapping into that pure Australian greatness. Gold Ledger Award-winner “Vowels” is an interesting little comic book series written an illustrated by a man called Skye Ogden. Mr. Ogden deviates from the normality of “regular” comic book creation by eliminating the use of words within “Vowels”, relying only on its visuals to tell the story and all the while asking the question; “does it really take words to tell a good story?”. “Vowels” is essentially a collection of five different short stories, all of which are connected in one way or another. The comic deals with the themes of love, brutality and the human condition but from odd and interesting points of view, most of which aren’t even human. To go into each and every story would be unnecessary simply because each of them can be taken in certain ways depending on who exactly the reader is. Different people will pick up on different story elements and it all depends on the way in which they think. The way I saw it: “Vowels” deals with the blossoming of love, the separation of hearts, the horror of universal barbarity and the potential of change within ones self. Obviously this was what I took away from “Vowels” but I could imagine others seeing it differently. The stories flowed into and through the next like a coursing river with clear connections being seen throughout every individual tale. Despite the lack of dialogue, characters were quite interesting and their personality types, for lack of a better term, were perfectly clear from the very moment they were introduced. From the very first page right up until the last I found myself hooked on “Vowels”. I was drawn into re-reading it over and over again in an attempt to discover as much as I could about it or to catch something I may have missed during the last read. It piqued my interested, it held my attention and it practically forced me into enjoying it. 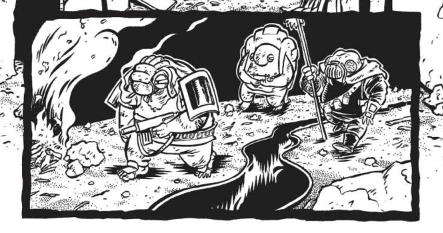 A great deal of extra weight is placed on the aesthetics of “Vowels” seeing as there are no words to tell a story, instead only leaving the panels to do double the work. Lucky for the reading audience, Skye Ogden has a perfect grasp on his own drawing style which in turn (I assume) made it a great deal easier for him to be able to express certain things through design rather than writing. The reason I say this is because I felt that it was easy to pick up on certain things he was laying down thanks to the way in which the comic was drawn. It’s quite the amazing feat. Mr. Ogden has an interesting fusion of illustration styles that, while extremely detailed, definitely throws back to old-school cartoons. I was extremely impressed and all around envious of the confident art style he employed in “Vowels”. There is so much emotion sealed within the panels of “Vowels”. Be it the expression of a particular character or a sweeping shot of a desolate environment, I really felt the way in which I assume Mr Ogden intended. Many symbolical images were used to promote thought in the reader; an empty desert, the skyline at sunrise, a single tear rolling down the cheek of a humanoid (but not human) being. They all mean something, it just takes that extra step of thought to figure them out. There’s something brilliant about comic books as a medium that keeps people hooked for life. 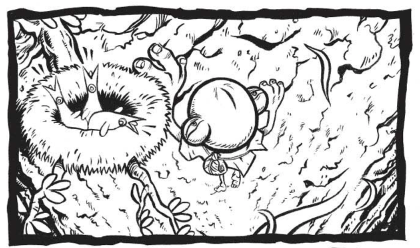 Some would say that it has to be the intricate blend of story writing and cinematic illustration that makes reading a good comic as rewarding as it is but after experiencing “Vowels” I can’t help but somewhat disagree with that. As a comic with absolutely no dialogue, “Vowels” destroys all preconceived notions of what exactly makes a comic book great. It tells deep and sophisticated tales in much the same way a standard comic book would, though perhaps even greater. 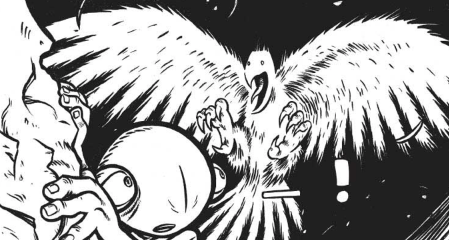 Skye Ogden takes a farfetched idea like “wordless comic books” and executes it beautifully. It makes you think, it makes you feel but most of all it makes you appreciate the power of a good comic book. 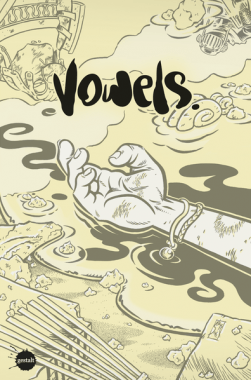 Words or no, “Vowels” is definitely a release that any comic book with an open mind could enjoy. 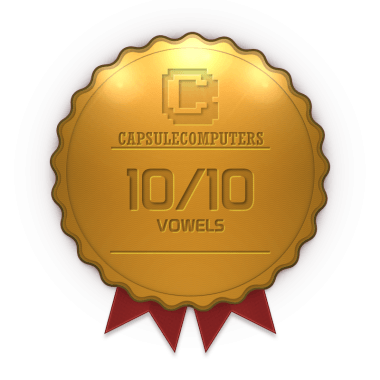 “Vowels” succeeds at doing something uniquely different, that alone makes anything great!